Today it’s Hina Matsuri in Japan, also known as Doll’s Day or Girl’s Day, so I decided to make a Japanese meal to celebrate from Michigan. 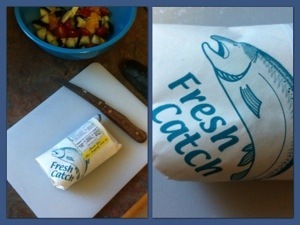 I was really excited to find a simple, pretty-looking recipe for chirashizushi using fresh, sushi-grade tuna. Chad went all over town in search of tuna I could use for the recipe, and finally found some at our local D&W supermarket. 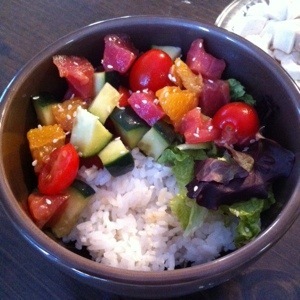 Chirashizushi is basically a bowl of sushi rice topped with fresh fish, and–in this case–a colorful salad mixture. Yes, I know this picture is blurry, but at least there are cute dolls decorating it. In addition to the chirashizushi, I also made yudofu (recipe at my old blog, here!) and ichigo daifuku. Yudofu is basically tofu boiled with kombu (dried kalp), and ichigo daifuku is a lovely spring treat consisting of fresh strawberries wrapped in sweet red bean paste and mochi. Here you can see my colorful bowl of chirashizushi, as well as the plate of yudofu in the background. 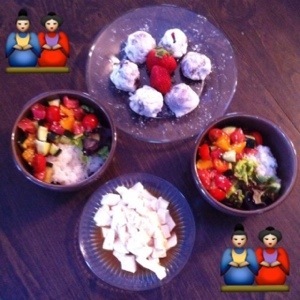 I used traditional white sticky rice rather than the brown rice for which the recipe called. 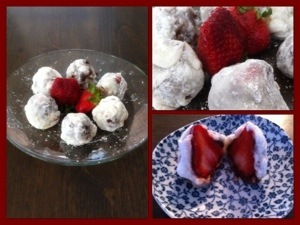 Here are some up-close pictures of the ichigo daifuku. I had to do some conversions when using the recipe because everything was in grams and ounces, so I think I’ll be experimenting to make them look prettier in the future. When it comes down to it though, I didn’t care too much about how they looked because they tasted really yummy, and totally brought me back to Japan (they were one of my favorite Japanese sweets! Natsukashii!). You can find the recipe I adapted by clicking here. We really enjoyed having a Hina Matsuri dinner, and I was so glad everything turned out! Hope you have a lovely Girl’s Day! Next Post Me Oh My Oh! all of that looks so good! the chirashizushi is really colorful and the ichigo daifuku looks tasty. today i’m going to make oreo balls for fat tuesday and bring them into work.